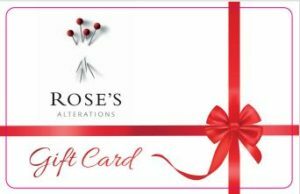 Rose&apos;s Alterations Gift Cards make great gifts for holidays and special occasions! Our gift cards are good for any services including Clothing Alterations, Dry Cleaning, Bridal & Wedding, "Your Place," Corporate & Groups, Garment Remodelling, Fine Meds, While-You-Wait, Knitwear Repairs, Wholesale Division, Leather & Suede, Dressmaking, Pattern Drafting and "On Behalf Of Program." Each card can be loaded with any value and have no expiry date. To order, or make any further queries, please ask our staff on your next visit or email giftcard@roses.co.nz with your contact details. We will call you to discuss.